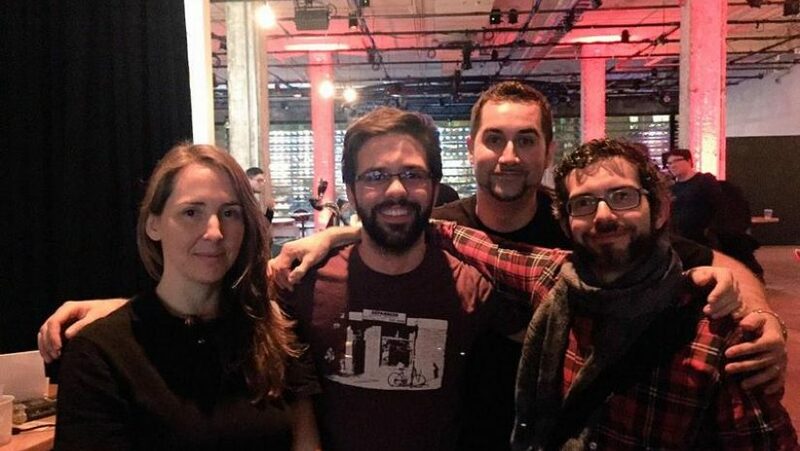 Recently, Behaviour Interactive gave an excellent talk at IGDA Montreal. Follow the jump for details on our coverage! Click here to see audio and images from the presentation. I spoke with a number of wonderful people, Mathieu Beaulieu – Producer, and Christine Marsh – Lead UI Designer among them. I was also extremely fortunate to get to sit down for a few minutes with Dave Richard – Lead Game Designer, Martin Poirier – Technical Lead, and Ian-Frédéric Dissaux – Lead Engineer, to ask them some questions. Here below is the interview! I hope you all enjoyed it, and again, more thanks than I can muster to everyone at Behaviour for being so friendly and helpful. That being said, I didn’t go empty-handed. If you’d like to see the gift I brought Behaviour / have a chance at winning some yourself, go here! Erris: Okay! So, we know that Behaviour did some work on the 890 Jump, ah, what did Behaviour do for that ship? What was your role on that? Dave Richard: Ok, so, it was right from the beginning, from the concept. We worked directly with Chris and the ship team to determine what the ship was, what was needed in it, and then we did the first wave of concepts, the basic look etc. I’m not the artist here, so I’m just scrambling here and trying to explain it to you, remembering. But also, there’s the level design, cause inside that ship, the 890 Jump is massive, so lots of concept art, lots of iteration, and most of the iteration comes from making it real. The space that the engines take, Everything, where everything fits on the inside and on the outside, so the defenses, they need to go inside with a beautiful finish, all this stuff was the most complicated part. Martin Poirier: And I think the 85X that goes inside was also designed in Montreal, and I think the guy that did it worked on car designs before, and he approached it with, really, a car-design look, with sleek lines and everything, and it was super nice watching him work. Erris: One more question on the 890 Jump before we move on, while most ships that exist in the game are very, very ‘gamey’, they’re for dogfighting or they’re for mining, the 890 is very much for, well, stepping back and having luxury, and just living. Did that change the design, how you approached designing the ship at all? Dave Richard: Well, we knew from the start that it was a luxury ship and, we wanted it to be, if you have this ship, you’ve succeeded, you know? Just, have your staff, pilot the ship, and you just, step back into your jacuzzi and enjoy the ride. So, absolutely, we had luxury in mind, and we based the concept around yachts. That’s the idea. Erris: Okay! that makes a lot of sense. mobiGlas. It looks like it will, essentially be an in-game mobile operating system, kind of like you get right now on android phones or iOS, what kind of approach have you taken to designing the OS for mobiGlas, and is it something you thought you’d ever have to do for a video game when you became a game designer? Dave Richard: That’s a couple of great questions. So, no, I didn’t ever think that this would happen. I always found that diegetic interfaces were really cool and awesome, and I would like to work with them, but this thing is just…it’s just insane. It’s not just diegetic, like you said, it’s an OS. we’re building an OS from the ground up. So, how did we approach it? At first, it wasn’t an OS. It was a collection of modules. AS we were building more apps for it, we really started to understand that we needed something like, a complete system, a complete OS that would be understood, so that every app kind of follows the same scheme, so that, well, the user experience is good. Martin Poirier: And on the engineering side, not to toot my own horn, but the docking system that we’ve done enables us to do these kinds of things. So we can currently display the contacts list, either in your ‘fast’ contacts list or in the lobby interface, but we can also display any kind of data in any mobiGlas screen, and it will be skinned to that screen, so it enables the design team to sort of skin all they want. If they want to do a more military mobiGlas, or a more ‘popular’ mobiGlas, then we can just push the data and get it skinned in any kind of interesting way. Erris: Yeah, there’s already multiple mobiGlas right? Dave Richard: And, if I can add to that, I mean, on the design side, again, once you’re in that mind-set that everything is in fiction and branded, it becomes really easy to imagine a game feature appearing as an app that a developer did, in fiction, and how it will be used by a character. At this point, it’s just part of the process, and we’re getting really fast with it. Ian-Frederic Dissaux: Back to engineering on a little side-note, one cool aspect of the mobiGlas, the augmented reality module, that’s really interesting because, as well as thinking of it for the end-game user, you have your visor, you have your vision, and you can have additional information when you look at a certain object. What’s really useful here from a dev standpoint it adds extra dev functionality to have debug information, so we can use the game feature in a specific way with a specific module to help us debug stuff, and that’s a really interesting thing where, that thing, that tool is so useful in the game, it will be so useful for a developer. So that’s one thing, we’ve come to the conclusion of also doing it that way, so we can cut down on dev time, and can help with debugging. Martin Poirier: So, mobiGlas has a super interesting feature, the home screen is kind of like the iPhone or Android home screen. It has a system of slots with applications, and it has a ‘featured’ slot. So, lets say you’re in your hangar, the ‘featured slot’ will be Arena Commander. If you enter a shop, the featured slot will be the app for that shop, and that sort of thing. And that’s built up dynamically. If you go near a shop, the shop tells the mobiGlas, hey, you’re in the shop, and this sort of populates everything, and everything sort of works. David Richard: Can you tell we’re really passionate about mobiGlas? Erris: I can! Can you tell that we, the fans, are too? Like, I can’t wait to see what you guys do, really. Ian-Frederic Dissaux: One last note, on a social aspect, we have, at work, mogiGlas. Whenever any of us, in an e-mail or in a skype conversation, whenever we misspell it, that’s one shot. And these get accumulated until an event, where we need to take those shots. So it really forces us to write it correctly, because it was happening so much that, hey, lets make fun of it. Martin Poirier: So, just for reference, it’s lower-case m, capital G, and one s.
Ian-Frederic Dissaux: that’s shots my friend! Erris: I’ll do them later! I’ve got to drive. So, for Dave, as a game designer, what are the best parts of working with Chris Roberts? Ian-Frederic Dissaux: If I can just insert for Dave, Chris Roberts is only one man, and he only has 24 hours a day, so sometimes you have to wait for feedback a bit before he gets back to you, but he will always get back to you with stuff. Dave Richard: Yeah, I mean, he’s looking at everything. It’s like this guy lives, it’s like he’s always up. He’s overseeing the project like, he’s there. That’s for sure. Ian-Frederic Dissaux: We have a skype engineering chat across all studios, and sometimes he gets in and he’s all, hey, why is that broken, or hey, you know, why is it doing that, or, you know, I worked on that system previously, here’s the information you need. He can jump in at any time, in any module, and in any conversation, so he’s really, really into the project. It’s amazing. Martin Poirier: Just a quick anecdote, I think it was…one week before shipping AC 1.0, before Christmas, I was there on the weekend, and I had to code-review something (we always do code reviews to make sure nothing’s broken), and it was like…on the Engineering side, I was saying, ‘hey, can I get a review on this?’ and no answer, and an hour after that, Chris said ‘hey, did anyone review that’, and I was like, no, and he was like, ‘Okay, I’ll do that!’ So he did. Erris: Oculus Rift. Has there been any thought for the mobiGlas and the Rift? Dave Richard: Okay, so, I have the kit on my desk actually, it’s Martin’s kit, but I have it now. I’m keeping it. And, yes, obviously for the mobiGlas, we’re thinking about it in design, and we’re also trying things when we’re doing mockups and concept phases for the mobiGlas apps and functionalities. We have the Rift in mind, to offer something special when you’re using the mobiGlas. And, like Martin was saying earlier in the presentation, because we’re actually the character using the physical device, it’s going to be great. I can’t wait to actually see the mobiGlas in game with the oculus. Erris: Given that there are studios all over the world working on Star Citizen right now, how much have you had to alter your code systems to work with theirs? Is that something you’ve had to do at all? Martin Poirier: Well, everyone sort of works with everyone else, so I was talking earlier in the talk about the context system and our docking system, that’s something we built in Montreal. The context system is something we had already, and the docking system is something we built with the LA office, specifically for the Visor, when it’s done. It’s something we’re pushing to the other studios as well, because it’s super-useful and it’s something that other studios are trying to use, and for the same reason other studios are developing tools that we’re starting to use. So, we’re not so much changing stuff because of their opinions, but we’re more molding stuff to everyone’s needs. Ian-Frederic Dissaux: We do, depending on the system we develop, sometimes, for instance we mentioned the Tag system, it’s adding meta-data to assets, so you can imagine a tremendous amount of uses. We developed that system in house, we published a few videos of use cases that we have for our needs, and then other studios will weigh back in, saying they’re thinking of using that system, and asking how they can use it, is it already supported. And we’re doing that in Behaviour, but other studios are doing that as well, building tools that we’re going to use after, so it’s really this kind of, lets build something that will be used by a lot of people, because we’re all working on the same game, and there’s so much content to create that we can’t make doubles of tools. Martin Poirier: Yeah, I mentioned code reviews before, that’s also a great tool we use to spread knowledge across studios, so, not only will I ask people in Montreal to read my code, unless it’s something very specific, if it’s something that’s large and I want other studios to see it I’m going to ask them to, to review it. Erris: Yeah, it seems the entire game is coming along more quickly as you all develop these kinds of internal tools, and that’s great. Dave Richard: Definitely. So, very quickly, some things we’ve developed for previous releases are very flexible systems that we’re only starting to see, we’re only starting to see the tip of the iceberg. Erris: Is there anything any of you want to add? Things you’re looking forward to, things you want to say to the community? Ian-Frederic Dissaux: I’m always excited about the new flair releases, personally. That’s one of the things I oversee on the team, so, now we’ve seen ship miniatures, we’ve seen liquor cabinets, and obviously we’re planning for additional ones, and there’s one in particular that I’m really looking forward to getting out to people, I can’t say what it is, but it’s coming, and I cannot wait to see the fan feedback on that one. So, I’m pretty eager for that one. For me, that’s one of my personal…communication with the community, this is one thing I tremendously, I, I adore. I adore getting things out to people, seeing their reaction, seeing them use it on youtube, and feedback, it’s amazing. Ian-Frederic Dissaux: Yeah, we really want to make it something special, we want to make it something so that people are excited when it’s coming soon. You know, that’s what we want. Dave Richard: Okay, I want to segue into room customization, something we talked about last year quite a few times, so, this is something I’m looking forward to, I mean, with all these flairs, as great as they are, they’re packing up right now. It’s something that’s going to happen, at some point you’ll be building your layout inside your hangar, your living quarters, and you’ll be able to customize it. that’s something that’s going to be awesome. I can’t wait to see players on youtube showing off their spaces. So, something I’m looking forward to. Ian-Frederic Dissaux: I’m looking forward to flying my Xi’an Scout, the Khartu Al, eventually it’ll be in and I’m going to kick the crap out of you guys. Erris: I just have to say that, The Relay crew, my coworkers on The Relay, we’re all really looking forward to Social module, we have one guy who has most of the ships, and we just want to go in there, and…see everything, see everything that you guys, and the whole Star Citizen crew, have been doing so, thank you all. On behalf of…of everyone. Dave Richard: And thank you! Thank you all, I mean, for your passion, your dedication, to this project. This is amazing for us, working with you guys. It’s, it’s the best project I’ve ever worked on, in all my career. Ian-Frederic Dissaux: Yeah, I mean, you guys are making the game with us, thanks. Thanks for your continuous development support, really. Martin Poirier: And if you get melting faces in the game, we’ll say it’s a bug!